"For a PDF version and to print please click anywhere within this sentence." Thank you for viewing this petition to pass a new amendment in the state of Florida. Please read, sign and share. Leave your comments down below. The Florida Cannabis Act (#16-02, formerly #15-19) may appear on the ballot in Florida as an initiated constitutional amendment on November 6, 2018. The amendment was not put on the ballot in Florida as an initiated constitutional amendment during the election on November 8, 2016. The amendment would legalize possession of up to one ounce of marijuana by residents at least 21 years old. Residents would also be allowed to cultivate up to six plants per household, but only three or fewer plants could be mature or flowering. The plants would need to be grown in “an enclosed, locked space,” and users would not be permitted to sell the plants they grow. Under the amendment, marijuana would be treated like alcohol—it would be prohibited for residents under 21 years of age, consumers would need to show proof of age before purchasing marijuana from retail facilities and it would be illegal for anyone to drive while impaired or under the influence of marijuana. The amendment also outlines regulations for marijuana cultivation, retail marijuana sales, and manufacturing marijuana products. Although this marijuana legalization initiative did not qualify for the ballot in 2016, Amendment 2, a medical marijuana legalization measure, was put on the ballot. For more information about Amendment 2, click here. Regulate Marijuana in a Manner Similar to Alcohol to Establish Age, Licensing, and Other Restrictions. Regulates marijuana (hereinafter “cannabis”) for limited use and growing by persons twenty-one years of age or older. State shall adopt regulations to issue, renew, suspend, and revoke licenses for cannabis cultivation, product manufacturing, testing and retail facilities. Local governments may regulate facilities’ time, place and manner and, if state fails to timely act, may license facilities. Does not affect compassionate use of low-THC cannabis, nor immunize federal law violations. Marijuana advocacy group Sensible Florida created the ‘’’Regulate Florida’’’ campaign to support the 2016 version of the measure. 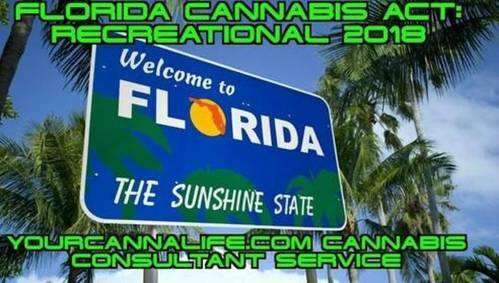 Sensible Florida is also sponsoring the 2018 version. Sensible Florida argued that the 2016 version of the amendment would have created a regulated system to prevent minors from accessing marijuana, curtail impaired driving, create jobs, and allow the state to use law enforcement resources for other issues. In Florida, signature requirements for qualifying an initiative for the ballot are based on the total number of votes cast during the most recent presidential election. Sponsors must collect a number equal to 8 percent of this total and in accordance with certain distribution requirements. Signatures can remain valid up to two years after the date they were signed, but they must be verified by February 1 of the targeted year, and therefore must be submitted prior to that date. The 2018 version of the amendment was approved on March 17, 2016. Supporters need to submit 753,603 valid signatures by February 1, 2018, in order to qualify the measure for the ballot. The deadline for signatures to be certified by the Florida secretary of state in order to qualify initiated constitutional amendments for the 2016 Florida ballot was set by law to be February 1, 2016. Since state law gives the secretary of state 30 days to verify signatures, petitioners need to submit signatures on or before January 1, 2018, to guarantee that an initiative qualify for the ballot in 2018.